Rev. Dr. Betty L. Fludd is a native of South Carolina and the daughter of the late, Albert and Bessie Smalls Void. She is one of nine children. Dr. Fludd’s childhood consisted of going to school and having lots of discipline; which she would never identify as child abuse. Her parents wanted obedient and well educated children who would respect themselves and others. Through the prayers and Spiritual guidance of her mother whose faith in God stood out to every one who got to know her, her mother was not just her mother, but became her best friend. The prayers, dreams hope and faith in God that her parents instilled were rewarding. Her parents had the blessed privilege of seeing all of their children complete high school and four of them attended college. Dr. Fludd attended both elementary and high school in Holly Hill, SC. She also attended South Carolina State University, Chevux Academy School of Cosmetologist in Orangeburg, SC. Dr. Fludd later moved to Connecticut. Since in Connecticut, she attended Norwalk Community College in Norwalk, CT, the Connecticut Institute of Christian Religion, Bridgeport, CT (housed at Messiah Baptist Church during that time) and Saint Vincent’s Medical College, Bridgeport, CT. She received her undergrad, Masters, and Docorate Degree from North Carolina Collegeof Theology, Wilmington, NC/School of Higher Learnings, Hamden, CT.
Dr. Fludd accepted the Lord Jesus Christ at an early age. She knows and loves the Lord! She is able to tell her story about the great things He has done and is still doing in her life. She knows that it is by His power, grace and mercy and love that she is still here. Like all of us, she had her mountaintops and her valleys low, but through it all she can stand boldly for the Lord. She knows that she cannot run from God, as she tried. She has harkened and surrendered to the call that He has placed on her life. Dr. Fludd stands today as a Born Again Child of God. 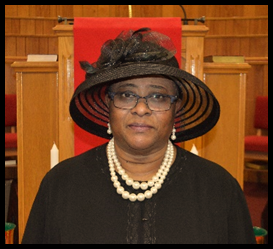 At the Messiah Baptist Church in Bridgeport, CT, she is an Associate Minister, an Instructor of The Discipleship Classes, Minister of The Health and Wellness Ministry, Bible teacher and mentor. Her church family loves her dearly. Dr. Fludd is employed at Soundview Medical in Norwalk, CT as a Billing Specialist. Dr. Fludd resides in Bridgeport, CT where nearby she has her daughter, Georgette, son-in-law, Charles, granddaughters, Alexis and Aniya Shivers, grandson, Charles, Jr., great granddaughter, Bailey Nicole Rashed. neither are your ways My ways,” saith the Lord.